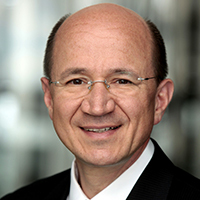 Christof Ehrhart took over as head of corporate communications at Deutsche Post DHL in 2009. Since then he has established an integrated strategic approach for the Group combining reputation building and stakeholder engagement in order to build social capital. Before joining DHL, Ehrhart was head of corporate communications at EADS, and he has worked in senior communications roles at a number of German and overseas multinationals, including Bertelsmann and later AOL Bertelsmann, JT International Germany, and Schering AG. The most recent one was when in March 2017, we introduced a zero emission target for 2050 which was developed and communicated by my team. This is not only good for the planet but also a great customer acquisition tool for our sales teams. Right now digitalisation poses a significant challenge and great opportunity at the same time. Corporate communications as a discipline has to find the right balance between total disruption and mere complementation. By working in permament crisis mode (processes) and by digesting big data (algorithm-based) and small data (androrithm-based) at the same time. By reading, doing all kinds of sports preferably outdoors and above all by spending time with my family. researching the societal contribution of professional communication in the age of VUCA and teach the next generation of communicators and leaders.